In the smartphone market, manufacturers offer miniature or compact versions of its high-end flagships. Of course, such a reduction in size often affects the equipment, but sometimes the mini smartphone offers the same quality as the flagship, but in a compact format. In line Samsung Galaxy Tab S is true just recently, but for the segment of tablets. Despite the significant differences on the diagonal, the tablet Galaxy Tab S 8.4 was virtually identical characteristics bigger model 10.5. When choosing a compact tablet, of course, have to put up with a smaller diagonal display, but otherwise you are getting a smaller copy of the Galaxy Tab S 10.5 with the same convincing display Super AMOLED, comparable performance, identical cameras and even contradictory fingerprint reader. To compensate for the reduced number of diagonal manufacturer has increased pixel density due to an identical resolution. By itself, the tablet is very thin and light, despite the plastic case it does not look cheap, workmanship raises no objections. Despite the decrease in battery capacity, we have the same battery life as that of the “older” model Galaxy S Tab 10.5. Compared with many other manufacturers of tablets Android, Samsung modifies the software and interface. Some applications are really useful; TouchWiz user interface in the latest version looks modern and integrity. Of course, in reality there are important personal preferences that you have more important: a clean version of Android or from Samsung. AMOLED displays seem to us an important step forward in the segment of tablets. If you decide to buy a tablet with a screen is AMOLED, at the moment will have to choose between the Galaxy Tab S 8.4 and S 10.5. Two models have almost identical set of advantages and disadvantages, so the choice between them depends on personal preference and budget. The tablets are very similar, so the “older” model, you essentially pay extra just for the diagonal. 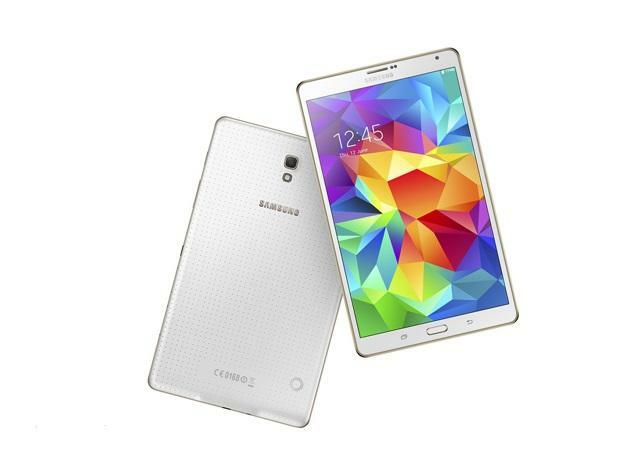 If you want a normal LCD screen, the Samsung offers here Galaxy Tab Pro 8.4 at a very attractive price of 220 euros. Tablet Galaxy Tab S 8.4 at a price of 380 can’t be called cheap. But the unique display and integrated set of features to justify the price – at least if you have important quality screen. Yes, Galaxy Tab S 8.4 wins the award of being “Excellent”. This was all about the 2014 launched Galaxy Tab S 8.4 and this year also Samsung give us surprises with the fully powered Samsung Tab 5, but launch date is not near we have to wait for month and yes of course they would be cheaper solution.